DanceOutfitters helps you make all of the right moves with quality dance apparel and accessories. To better serve a variety of customers and their needs, we also carry gymnastics wear for athletes and praise wear for church dancers. 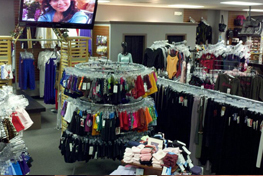 DanceOutfitters has a full line of complementary tights to wear with your leotards, including footed, footless, and transition styles. Children and adult sizes are available in a rainbow of colors. Find quality dance apparel and accessories in the right sizes by calling us at (757) 548-6688. Monday - Friday, 10 a.m.-7p.m. © 2015 DanceOutfitters, Inc. All rights reserved.